The British baritone Alan Opie was born in Cornwall and studied at the Guildhall School of Music and the London Opera Centre. His career began with English National Opera (then Sadler's Wells) where he was appointed Principal Baritone while still a student. 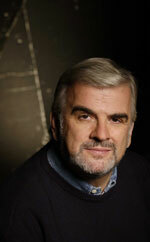 Alan Opie has performed with all of the major International opera companies and has been involved in over 20 recordings two of which won Grammy Awards in 1996 and 1998. Alan was nominated for the Olivier Award for ‘Outstanding achievement in opera’ for his performance of Falstaff with the English National Opera.